The circus is in town! There’s nothing quite like the circus; the painted faces and funny hats, the striped pants and acrobatics… It’s fun for all ages. This weekend and all through next week Puerto Rico is blessed with an international cast of circus characters. The first of its kind, Circofest has brought together artists from all over the world to bring joy and happiness to our little island. Jugglers, clowns, fire breathers, aerial silk dancers, slack liners, and daring adventurous magical people of all kinds. 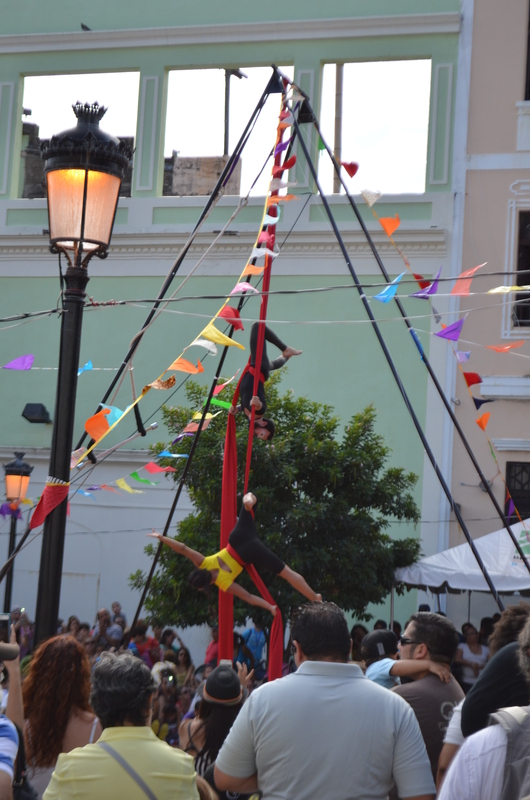 This weekend they filled the streets of Old San Juan with their art and will continue to spread the joy throughout various parts of the Island during the week to come. I recommend it. For schedules and maps check out their page Circofest.com I really hope they keep coming every year and I can get better pics next time. 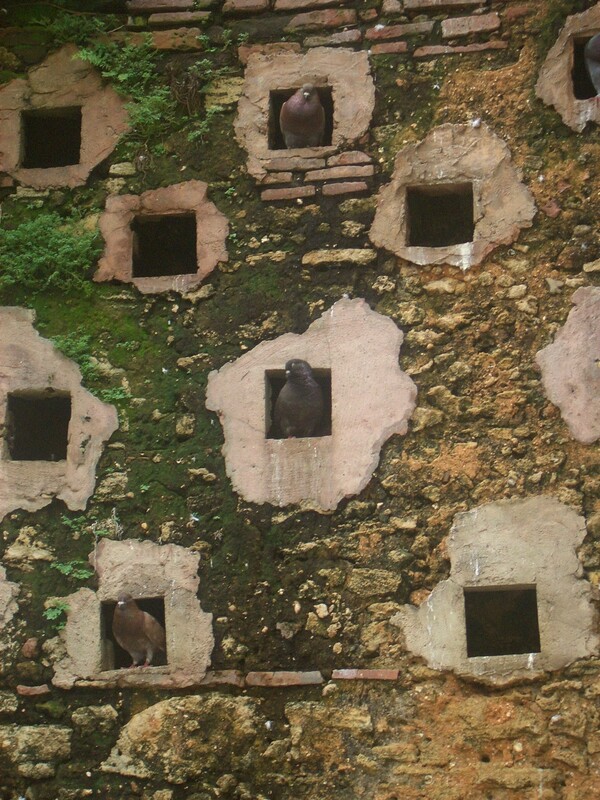 El Parque de las Palomas is a pigeon park. At the end of Calle del Cristo and right beside La Capilla del Cristo, the pigeon park is a classic kid spot. Located right above one of the old city walls, the breeze from the bay wanders in. It’s a good place for a rest. You will notice holes in the big wall on the side of the park. Those are pigeon holes. It’s like a giant bird apartment building! Why would anybody build a giant pigeon apartment complex? Well… the pigeons were kept for food. Yup! Back in medieval times pigeons were part of the regular diet. It was practically a free food enterprise. So, do you eat the pigeons? No, no… worry not. At the pigeon park you now feed the pigeons. They sell corn and petit-pois as food. Forget the corn! Go for green petit-pois. They love them! The birds stand right on your hand to feed. NOTE: Not for the finicky! These are pigeons. They are dirty. They stand on you and scratch a bit with their claws. They peck at your fingers and they also swarm around you, so if any of that would bother you, don’t take the food. If you don’t have food in your hand they won’t bother you. ANOTHER NOTE: If there should happen to be no petit-pois, go to the grocery shop in Plaza de Armas and get a bag. 😉 The pigeons at Plaza de Armas are the same ones from the park so go ahead and feed those too.